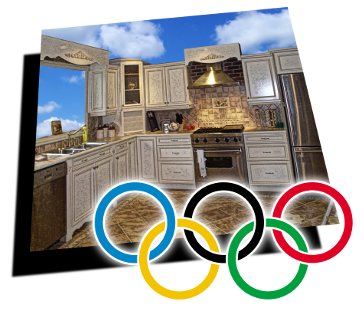 This year's Kitchen Appliance Olympics once again pushed forward the barriers of food preparation technology, wowing the crowds and smashing some long-standing performance records. Kevin McClusky was on fine form and managed to set a new world record for omelette preparation with the help of the modified Pifco Whiskomatic 500. There were also exciting scenes on the slicing and dicing front, with new standards being set by Kenwood's Mark III Cubivator, which has been specially redesigned for this event. Nevertheless, honourable mention must go to the runner up, Strumpet Industries' Vegomatic, which also put in a fine performance. But the competition was not without its setbacks. Our sympathies go out to the unfortunate marshal who lost a finger to the MagiChop Sawmaster Deluxe when it careered out of control during the speed carving event. And, as you may have already heard, there was much concern during the closing ceremony when a Doughman's Computer Controlled Automated BreadBuddy exploded and covered everyone in the immediate vicinity with burning toast.